Discover how natural selection has shaped animals and plants together through their ancient and persistent dependencies, and defenses with one another. 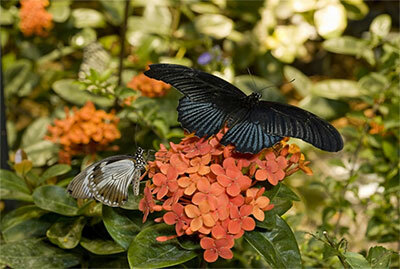 Tickets are required for the Butterfly Pavilion, live butterfly experience, where visitors can walk among hundreds of live butterflies and pesticide-free plants to observe butterfly behaviors ranging from flying and sipping nectar at flowers to roosting and emerging from chrysalides. These butterflies hatch from pupae raised on farms in Africa, Asia, and North and South America. To maintain an environment conducive for butterflies, the temperature inside the Pavilion is 80-85 degrees with high humidity. Wheelchairs permitted in Pavilion, but no strollers allowed.